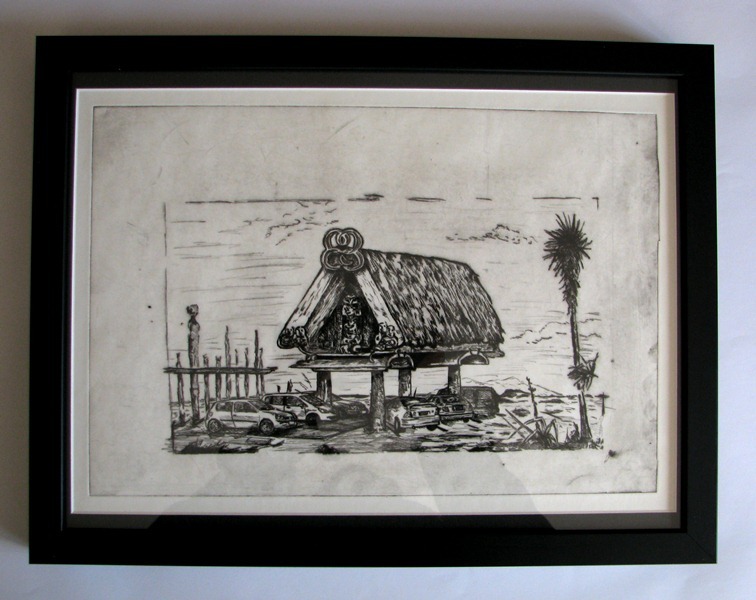 The Pataka 2.0 dry-point etch series is a extension of my ‘Piri Āporo’ project which looked at ‘glocalised’ campaigns, in particular supermarkets that utilise Maori cultural elements to appear of local orientation. The outward investigation of how others appropriate what was assumed open source material produced work that utilised ‘face value’ and stereotypes. The extension of this project became an inward evaluation of my relationship to supermarkets – the dependency traps, the dislocation from where food comes from, the values embedded in knowing your food and the land that sustains us. I have hope for the future as contemporary culture is trending towards community gardens, localized markets, gardens in homes and schools. Martin Awa Clarke Langdon (Tainui) is a South Auckland-based multidisciplinary artist whose work explores the tensions and opportunities of bi-cultural duality and the third space. Langdon has recently shown in group exhibitions, Ngaru Rua curated by Gabrielle Belz for Nathan Homestead, South Auckland and Mana for Jam at Toi Pōneke Gallery, Wellington. His solo exhibition Dysfunctional Harmony at Papakura Art Gallery in January 2013, presented a series of works and ideas explored during his Postgraduate Diploma of Fine Arts undertaken at the University of Auckland in 2012.